314 pages | 29 B/W Illus. This influential volume of papers, chosen by Professor Annette Karmiloff-Smith before she passed away, recognises her major contribution to the field of developmental psychology. Published over a 40-year period, the papers included here address the major themes that permeate through Annette’s work: from typical to atypical development, genetics and computation modelling approaches, and neuroimaging of the developing brain. A newly written introduction by Michael S. C. Thomas and Mark H. Johnson gives an overview of her research journey and contextualises her selection of papers in relation to changes in the field over time. 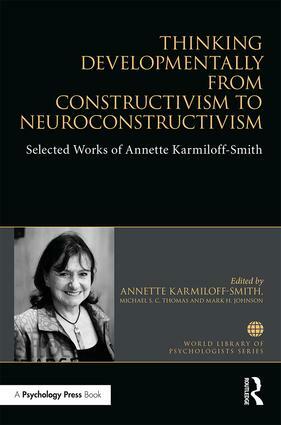 Thinking Developmentally from Constructivism to Neuroconstructivism: Selected Works of Annette Karmiloff-Smith is of great interest to researchers and postgraduates in child development specialising in atypical development, developmental disorders, and developmental neuroscience. It also has appeal to clinical neuropsychologists and rehabilitation professionals. FROM IMPLICIT TO EXPLICIT KNOWLEDGE – TYPICAL DEVELOPMENT, Karmiloff-Smith, A. & Inhelder, B. (1975) "If you want to get ahead, get a theory", Cognition, 3(3), 195-212.; Karmiloff-Smith, A. (1986) "From metaprocesses to conscious access: evidence from children's metalinguistic and repair data", Cognition, 23 (2), 95-147.; Karmiloff-Smith, A. (1990) Constraints on representational change: evidence from children's drawing". Cognition, 34, 1-27. ; Karmiloff-Smith, A. (1994) Beyond Modularity: A Developmental Perspective on Cognitive Science. Behavioral and Brain Sciences, 17(4), 693-706.; FROM TYPICAL TO ATYPICAL DEVELOPMENT, Karmiloff-Smith, A. (1998) Development itself is the key to understanding developmental disorders. Trends in Cognitive Sciences, 2(10), 389-398.; Karmiloff-Smith, A., Brown, J.H., Grice, S. & Paterson, S. (2003) Dethroning the myth: Cognitive dissociations & innate modularity in Williams syndrome. Developmental Neuropsychology, 23(1&2), 229-244.; Karmiloff-Smith, A., Thomas, M., Annaz, D., Humphreys, K., Ewing, S., Brace, N., van Duuren, M., Pike, G., Grice, S. & Campbell, R. (2004) Exploring the Williams Syndrome Face Processing Debate: The importance of building developmental trajectories. Journal of Child Psychology and Psychiatry, 45(7), 1258-1274.; GENETICS AND COMPUTATIONAL MODELLING APPROACHES, Karmiloff-Smith, A., Scerif, G., & Thomas, M. S. C. (2002). Different approaches to relating genotype to phenotype in developmental disorders. Developmental Psychobiology, 40, 311-322.; Karmiloff-Smith, A., Grant J, Ewing S, Carette MJ, Metcalfe K, Donnai D, Read AP, Tassabehji M. (2003) Using case study comparisons to explore genotype-phenotype correlations in Williams-Beuren syndrome. Journal of Medical Genetics. 40(2), 136-140.; Thomas, M.S., Knowland, V.C. & Karmiloff-Smith, A. (2011). Mechanisms of developmental regression in autism and the broader phenotype: a neural network modeling approach. Psychological Review, 118(4), 637-654.; TAKING THE BRAIN SERIOUSLY, Karmiloff-Smith, A. (2010) Neuroimaging of the developing brain: Taking "developing" seriously. Human Brain Mapping, 31(6), 934-941; TAKING THE ENVIRONMENT SERIOUSLY, Karmiloff-Smith, A., D’Souza, D., Dekker, T.M., Van Herwegen, J., Xu, F., Rodic, M. & Ansari, D. (2012). Genetic and environmental vulnerabilities in children with neurodevelopmental disorders. PNAS, 109, 2, 17261–17265. ; AND, ALWAYS, TAKING DEVELOPMENT SERIOUSLY, Karmiloff-Smith, A. (2006). Ontogeny, Genetics and Evolution: A Perspective from Developmental Cognitive Neuroscience. Biological Theory, 1(1), 44-51.; Karmiloff-Smith, A. (2009) Nativism versus Neuroconstructivism: Rethinking the Study of Developmental Disorders. Special Issue on the Interplay of Biology and Environment, Developmental Psychology, 45(1), 56-63.; Karmiloff-Smith, A. (2015) An alternative to domain-general or domain-specific frameworks for theorizing about human evolution and ontogenesis. AIMS Neuroscience. Annette Karmiloff-Smith was a world leading researcher in the field of developmental neuroscience. She worked with Jean Piaget, and held positions at the Max Planck Institute for Psycholinguistics in Nijmegen, followed by the MRC Cognitive Development Unit in London, the UCL Institute of Child Health, and the Centre for Brain & Cognitive Development, at Birkbeck, University of London.